In four years, we’ve grown to become the largest coalition of young, sustainable farmers in the U.S. Becoming a member of NYFC is a way to support our on-the-ground organizing efforts (Our National Day of Action, where farmers wrote to the FDA at 70 letter-writing parties in 30 states, was possible because of membership contributions.) It’s a way to connect with the national young farmer community and it guarantees you are represented in the federal farm policy process. 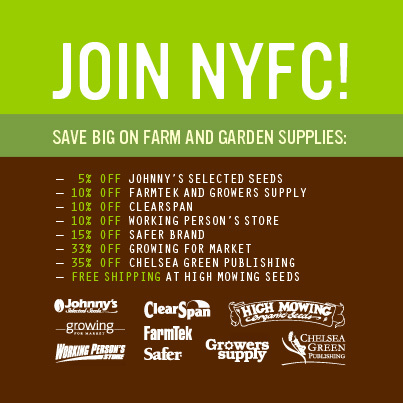 For just $3 a month, or $20 a year, you can help NYFC tackle the barriers we face as young farmers, and enjoy amazing discounts on the seeds, gear and books you need. Already a member but can’t find that email with benefit codes? Wondering if you’re up-to-date? Email Sophie at sophie@youngfarmers.org.